Asus is set to pre-install Amazon's Kindle for PC application on selected new netbooks and laptops. The announcement of the partnership with Amazon comes only a few weeks before Asus is expected to final unveil its plans for its 'Eee Pad' range of tablet PCs at Computex in Taipei in June. Asus, of course, also sells a lot of its computers directly via Amazon.com. As of this week, the Asus Eee PC 1005PE and UL30 will be sold with Amazon's e-book app pre-loaded. "Customers using Kindle for PC can enjoy over 540,000 books, including New York Times Bestsellers and New Releases, on ASUS' latest netbook and notebook products," reads Asus' press release. 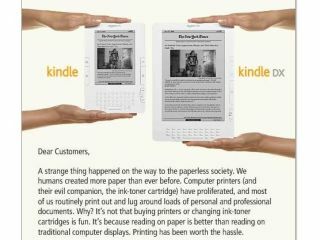 "Like all Kindle apps, Kindle for PC includes Amazon's Whispersync technology, which saves and synchronizes a customer's notes, highlights, bookmarks and last page read across their Kindle, Kindle DX, PC, Mac and other devices so customers always have their reading material with them and never lose their place whether at home or on-the-go." TechRadar will of course be bringing you all of the news coming out of Computex next week.